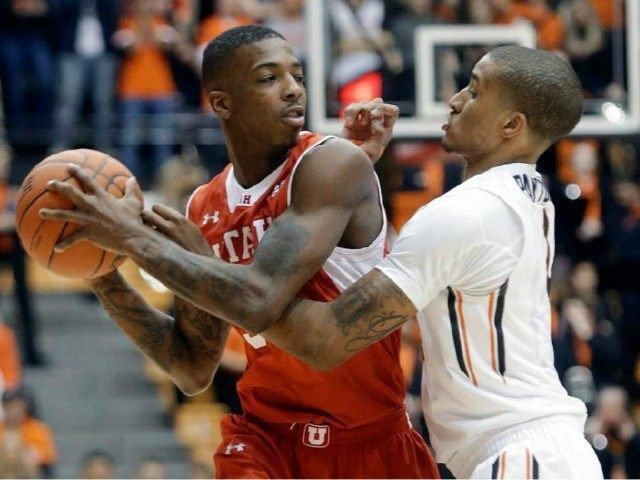 Thursday Delon Wright’s Utah defense ended Oregon State’s 14-game home winning streak by allowing only 37 points. The night before UNC blew by Jahlil Okafor’s interior defense for an unheard of 62 points in the paint against Duke. Here are the ten reasons Wright (worth 11.62 points a game at Value Add), and not Okafor (7.30) that should be Frank Kaminsky’s main competition for Player of the Year. LEADER OF A MUCH BETTER TEAM DEFENSE – Wright’s pressure on the ball leads a defense that shuts down opponents on the perimeter. Despite much-less heralded teammates than Okafor has at Duke, Utah now has the 4th-best defense in the country at kenpom.com while Okafor’s inability to stop opponents at the rim is part of the reason Duke has the 58th-best defense and the 141st-best defense against 2-pointers (47.7% made by opponents). Willie Cauley-Stein is a better overall center this season than Okafor, as demonstrated by leading the No. 1 defense which allows only 37.5% of 2-pointers and with Cauley-Stein jumping out to the perimeter when necessary, Kentucky is the nation’s best in allowing 26.2% of three-pointers to be made. OKAFOR’S INTERIOR DEFENSE THE PROBLEM. During the Duke-UNC game ESPN Stats tweeted out that Duke’s interior defense was giving up 34.1 points in the paint per game—the worst in the ACC. Only 53 teams have scored even 50 points in the paint in a game this year—so it happens once every 100 games or so—so the fact that Okafor plays center on a team that allows 62 points in the paint and lets teams hit so many two-pointers shows he is just not a rim protector. INDIVIDUAL DEFENSIVE STATS. In the three individual team defensive stats, Cauley-Stein grabs 18.0% of opponents’ misses, blocks 6.7% of all two-pointers and steals the ball 3.5% of all trips down the court. Okafor has a slight edge over Cauley-Stein only in rebounding percentage and is a mediocre shot-blocker and has few steals (19.1, 4.4, 1.6). Despite being a guard, Wright is not far behind Okafor in rebounds or blocked shots, and is one of the top steals guys in the country (13.2, 2.7, 4.2), so by position a better player on individual defensive stats. DEFENSIVE VALUE ADD. Put them all together into Defensive Value Add, and Cauley-Stein is by far the best of the three defenders (-6.17 points taken away from opponents per game), Wright is a very strong -4.5, and Okafor only takes away a little over two points a game from opponents (-2.41). BETTER BY POSITION. It is much easier for centers to get good stats (rebounds and easier shots from proximity to the basket) than a guard (has to handle the ball a lot more in avoiding turnovers and start from the perimeter). The 10oth-best shooting guard has a raw Value Add of 2.48 while the 10oth-best center has a raw Value Add of 3.38. This is why you see a SG+0.52 for every shooting guard and a C-0.38 by each center—the question is how much more does a player give you than you would normally get at that position. Wright is the best shooting guard in the country. Okafor is far behind Kaminsky and Cauley-Stein in overall value, so will finish as no better than the third best center. FREE THROWS. Wright draws a lot of fouls and hits 82% of his free throws. Okafor draws a lot of fouls, but his 0 for 6 against UNC puts him at 55% from the line and a horrid 44% (17 of 39) over the last eight games. You almost need to bench Okafor at the end of a close game, while you could never put Wright on the bench at the end of a close game. ASSIST-TURNOVER. Certainly you expect guards to have a lot more assists than centers. But guards also handle the ball a lot more and must avoid turnovers. Okafor has been turning the ball over almost four times a game his last eight games, including five against UNC. That, along with his 0-6 from the line, almost cost Duke a game in which they were heavily favored. Wright’s assist-to-turnover rate is an outstanding 3-to-1 (135 assists to 46 turnovers), while Okafor is a terrible 1-to-2 (only 36 assists to 71 turnovers). Put it together and Okafor has averaged going 2 for 5 from the line and turned the ball over 4 times a game over the last eight games. PERCENT OF POINTS NEEDED TO WIN. Fans enjoy poor defensive shootouts such as Duke’s 92-90 win over UNC, vs. ugly defensive grinds such as when Utah ended Oregon’s home winning streak 47-37. However, scoring must be measured against how many points the team needed to win a game. True, Okafor looked truly amazing on many of his 12 points against UNC with overpowering spins and back downs. However, Duke needed at least 91 points to beat UNC so Okafor’s 12 points gave them 13% of what they needed. Wright’s 9 points may not look like much, but the defense was so good that Utah only needed 38 points to win the game, so Wright provided 23% of the points needed to win despite going up against the best defensive guard in the country in Payton. Even before you get into the ways Okafor hurt Duke (five turnovers, 0-6 from line) and Wright’s five assists, even his scoring had more impact on the game. MATCH-UPS AGAINST TOP 5 OPPONENTS. Okafor played solidly against the best center, Kaminsky. But Kaminsky outscored him 17 to 13 and outrebound him 9 to 6. Thursday at Oregon State, Wright outplayed the next best point guard in Payton, besting him in points (9 to 6), rebounds (also 9 to 6) and assists (5 to 3). While the ACC ties with the top-heavy SEC with 13 of the top 100 players—there are no other ACC centers in the top 100. Wright has to go up against two Pac-12 shooting guards in the top 100 players in Payton and Stanford’s Anthony Brown—so Wright has overcome tougher match-ups. There are three reasons fans and commentators talk more about Okafor. Obviously a lot more fans watched UNC at Duke Wednesday than stayed up past Midnight on the East Coast to follow Utah at Oregon State. Fans like high scoring games with poor defense more than defensive grinds. Teams like watching future NBA players. Most have lauded my preseason projection of Wright as the most valuable college basketball player as he has taken unranked Utah to the Top 10. Still, most commentators rank Okafor as Kaminisky’s main competition most likely because a lot more people watch UNC at Duke than stay up past midnight to watch Utah at Oregon State, because fans prefer high scoring games to defensive grinds, and because most focus on who has the better tools to dominate at the next level. We never project a player to improve more than 2.5 a year, so Okafor would project to have the greatest Value Add in history (14.8) if he stayed three more years. Of course, the top prospects never put off the NBA lottery for that long. If Anthony Davis were still playing this year as a senior at Kentucky we would project his Value Add would have been 19.85, making him by far the greatest college player for the years covered in the database (click here for 2003-2015).